The mighty Acura NSX supercar is built at a place called the Performance Manufacturing Center in Ohio. 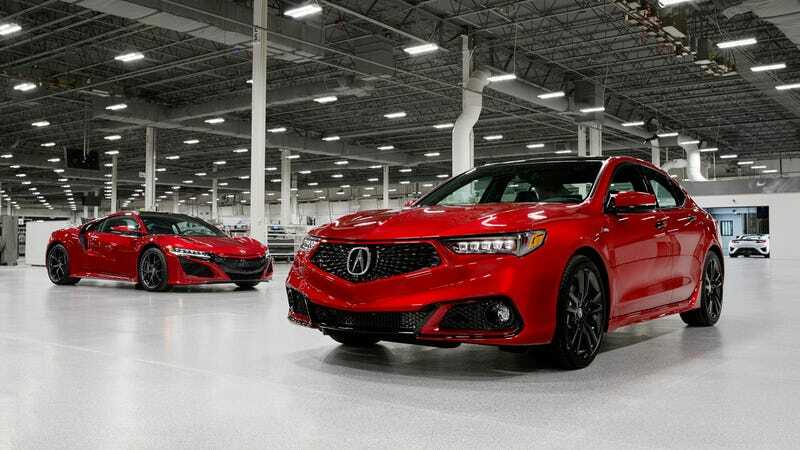 Hence the name of the 2020 Acura TLX PMC Edition–a limited-run sedan built in the same handmade style as the NSX. Neat, I guess, but mostly I’m hoping this is a harbinger for more intense Acura models. I’m not going to pretend that the car looks anything less than lovely with Valencia Red Pearl paint, black accents those sweet 19-inch wheels. But how did Acura manage to send the TLX to a place called the Performance Manufacturing Center for hours and hours of special treatment, and get it back without any tweaks to the engine or suspension? “This is just step one,” an Acura spokesperson told me over the phone. Though he didn’t divulge any future product secrets, he did strongly allude to the idea that the company was planning to expand its utilization of the PMC facility to dial up its cars in more significant ways in the future. Or maybe he just let me believe that after sensing I was disappointed that the 2020 TLX PMC, of which only 360 will be built, wasn’t getting any extra horsepower. The TLX’s best drivetrain option is currently a 3.5-liter V6 turning out a claimed 290 HP with a nine-speed automatic and torque-vectoring all-wheel drive, by the way. So the primary payoff of the Performance Manufacturing Center’s labor here is prestige, and I presume Acura is hoping this will spill some halo-effect sauce onto every other TLX on dealer lots. The TLX PMC, Acura’s people told me, will not be treated like “every other TLX,” and will in fact ride to dealers individually wrapped on their own carriers if that means anything to you. I’m not sure the 2020 TLX PMC Edition is a guaranteed candidate for future classic status without any adjustments to the car’s driving dynamics, but I’d have to see one parked next to a lesser trim before passing judgement. It is possible that the hand-assembled interior really is way, way nicer than what’s in any other TLX. At $50,000, the 2020 TLX PMC is at least consistent with the pricing of any other Acura–you’re basically getting the standard TLX with the big engine and every option, which already books out to about $47,000, plus easily a few grand worth of decorative pieces. Acura’s planning to give the same treatment to the MDX crossover SUV, and show off both at the New York Auto Show later this month. But what I’m really hoping is that a Mercedes AMG and BMW M-rivaling sedan is the next thing to come out of Acura’s special factory. That, or something like an electric Integra revival.